Recipes range from classic vanilla, chocolate, coffee, and strawberry to innovative creations like blackberry cobbler, toasted coconut, lemon curd, brown sugar and cinnamon, fresh ginger, salted caramel, maple bacon, matcha, chocolate hazelnut, and goat cheese and honey. She even includes flavours especially for the holidays -- gingerbread cookie, pumpkin pie, eggnog, peppermint mocha, and more. 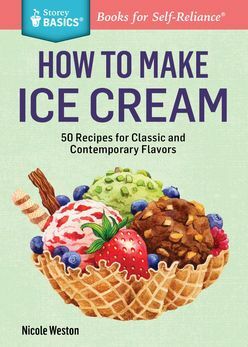 Making ice cream at home is fun and easy! Nicole Weston shows you exactly how to achieve delectable results with these 50 exciting recipes.